Marc Quinn's (1964) wide-ranging oeuvre displays a preoccupation with the mutability of the body and the dualisms that define human life: spiritual and physical, surface and depth, cerebral and sexual. Using an uncompromising array of materials, from ice and blood to glass, marble or lead, Quinn develops these paradoxes into experimental, conceptual works that are mostly figurative in form. 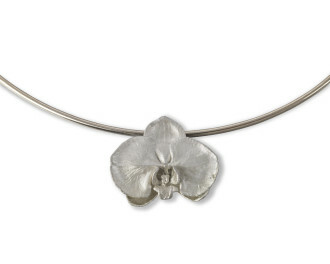 The British artist has used the forms of orchids repeatedly in his sculptures and this unique piece of jewellery is inspired by the artist's ongoing 'Flower sculptures' series. Here Quinn captures what he has described as “the purest and most magical transformation of reality into art”. In these sculptures, real flowers in a perfect state of bloom have been plunged into frozen silicone oil. As the flowers freeze they die, but in doing so, they become a perfect, eternal image of themselves. Above: Exerpt from Art As Jewellery, From Calder to Kapoor by Louisa Guinness (P. 237) featuring Frozen Strawberry, 2007, Necklace, 18k white gold with diamonds, 6 x 3.4 x 3.3 cm, edition of 10. Photograph by Alexander English. Quinn's sculpture, paintings and drawings often deal with the distanced relationship we have with our bodies, highlighting how the conflict between the 'natural' and 'cultural' has a grip on the contemporary psyche. In 1999, Quinn began a series of marble sculptures of amputees as a way of re-reading the aspirations of Greek and Roman statuary and their depictions of an idealised whole. One such work depicted Alison Lapper, a woman who was born without arms, when she was heavily pregnant. Quinn subsequently enlarged this work to make it a major piece of public art for the fourth plinth of Trafalgar Square. Other key themes in his work include genetic modification and hybridism. Garden (2000), for instance, is a walk-through installation of impossibly beautiful flowers that will never decay, or his 'Eternal Spring' sculptures, featuring flowers preserved in perfect bloom by being plunged into sub-zero silicone. Quinn has also explored the potential artistic uses of DNA, making a portrait of a sitter by extracting strands of DNA and placing it in a test-tube. DNA Garden (2001), contains the DNA of over 75 plant species as well as 2 humans: a re-enactment of the Garden of Eden on a cellular level. Quinn's diverse and poetic work meditates on our attempts to understand or overcome the transience of human life through scientific knowledge and artistic expression.